Apparently, researchers at the University of Cambridge are reporting that, based on their study, men with longer ring fingers, compared to their index fingers, tended to be more successful in the frantic high-frequency trading in the London financial district. 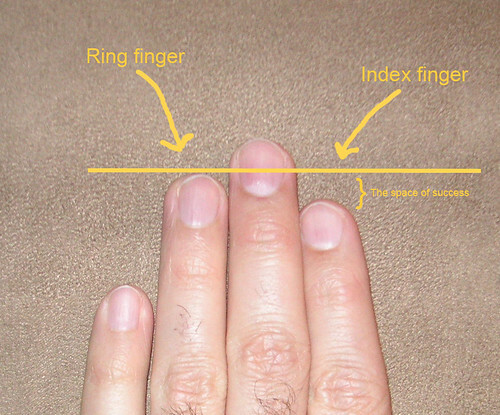 They also note that the same ring-to-index finger ratio has previously been associated with success in competitive sports such as soccer and basketball. It all seems to come down to male hormone androgen. Greater fetal exposure to androgen can lead to increased confidence, risk preferences, search persistence, heightened vigilance and quickened reaction times. As you can see above, my androgen levels must have been pretty high. Behold my ring finger and fear its hormonal omnipotence. It makes me wonder, though, if I should ask for a raise while casually displaying my hands. Will the gestures be distracting or mesmerizing? Or, if I go on an interview, should I include "handshots" with my resume? If, as the researchers found, finger length counts as much as experience, then I think I should definitely start near the top of the salary range. My fingers need pampering and room to grow, so I will need a large salary and an expense account, thank you very much. I invite you all to do the same. Handshots for all! Let the ring finger dominance begin!! Wow, your space of success is WAY bigger than me OR Justin's. Perhaps I should become your minion. Bow down and do my bidding!! Now, bring me a diet Dr. Pepper. Todd darling with those fingers you rule your nether reigons.